This is a post I wrote a few years ago for Positive Thinking Magazine. The article is about a spiritual trip I took to Sedona, AZ. I am getting ready to take another journey to Sedona so I thought I'd share this article here now. You were born with an incredible gift – one that is so beautiful, so profound, so magnificent that words can only barely begin to describe it. This gift is the spark of infinite wisdom that lives within you. It is that part of you that is eternal. It is the core of who you are, and yet it is possible that you have not begun to realize the full potential of this gift. This spark – also known as your essential spirit- is the key to living the life that you are meant to live. Making a strong and lasting connection with your essential spirit is the key to a life full of health, happiness, and success! Unfortunately, due to busy, hectic lives, many people are feeling drained, burned out, and disconnected from their essential spirit. If you are one of these people, it is likely that it is time to go on a spiritual retreat… a time to have a conference with your spirit. A conference with your spirit is a planned time away from daily routine to reconnect with your essential spirit more fully. It is a time to BE rather than DO. It is a time to allow the energy and beauty of the earth to wash away any stress/tension. It is a time to be quiet and still in order to hear your intuitive voice. Perhaps, most importantly, it is a time to evaluate where you are and where you are going to make sure you are aligned with your soul purpose. Even if you are not feeling burned out, it is important to schedule a conference with your spirit at regular intervals. I recently went to Sedona, AZ to have an in depth conference with my spirit. Sedona is one of my most favorite places in the world and an excellent place for me to strengthen my connection with my essential spirit. An important part of a conference with spirit is to be fully present in the moment. I began my mindful practice as soon as I landed in Arizona. I allowed myself to take in the scenery on the drive from Phoenix to Sedona. The landscape changes frequently on this 115-mile trip and it is a treat to see such variety. Then, as I approached Sedona, the highway curved and the scenery suddenly opened up to the breathtaking red rock vistas that are the hallmark of Sedona. It was a truly an awe-inspiring experience and one that I will always treasure. As soon as I arrived in Sedona, I immediately felt a shift in my energy and my mood. A quiet and peaceful feeling enveloped me and I had a profound sense of tranquility. I immediately felt more connected with my essential spirit. In order to facilitate the process of conferring with my spirit, I took time to meditate and allowed my stress and tension to melt away. I allowed myself to feel the energy of the earth and indulged in the pleasure of BEing instead of DOing. Each morning I took a walk on one of the many fabulous trails in Sedona. The views of the red rocks were absolutely stunning. Each path was different. Each path offered something new to see and experience. I made an effort to stay present in the moment and to take in every nuance of the experience. There is incredible wisdom in nature and I opened up to absorb this wisdom and connect with my own internal wisdom. As I stood in one of my favorite places in Sedona, I had a profoundly peaceful and transformative experience. In a clearing near the grand red rock formation, known as Cathedral Rock, there are hundreds of what I call stone gnomes – little piles of stones that have been carefully stacked one on top of the other. These stacks of stones (also known as cairns) are typically used as trail markers; however, in this area they seem to have been built, by the many visitors, as an ever-changing sculpture. When I stood in the middle of these little stone gnomes, I felt like I was in the most magnificent sanctuary. These little gnomes were all facing Cathedral Rock as if in prayer. I stood silently with them in my own state of prayer and reflection. I knew in that one moment that I was connected to everything in the Universe. I knew that I was right where I needed to be in my life. What a wonderful feeling that was! During my stay in Sedona, I evaluated my various work activities and commitments to see if they were in line with my soul path or purpose. I realized that I had taken on a few things that weren’t really in line with this purpose, so I decided to pull my attention from these activities. Before I agree to take on something new, I typically ask myself if this new activity is in line with my soul path; however, there are times that I find myself saying yes to someone or something before I really evaluate it. These conferences with my spirit, then allow me to weed out what isn’t working or isn’t aligned with my path. As I returned from this uplifting conference with my spirit, I realized that I needed to renew my commitment to my daily practices to nurture my spirit. While it is certainly easier for me to feel connected and nurture my spirit while on vacation - especially in Sedona, I can choose these feelings whenever and wherever I am. I am responsible for feeling spiritually connected. I can choose to maintain that feeling of deep peace and harmony that I feel when I am connected to my essential spirit. Preparation- If you are feeling burned out, frustrated, disconnected, and/or overwhelmed, it is a good time to plan a conference with your spirit. Even If you have been nurturing your spirit daily, a conference with your spirit is a good idea so that you can deepen this connection. Choose a place where you can go to get away from the daily grind and spend some quality time meditating and connecting with your spirit. You can choose to take a day, a long weekend, or a week. You might go away to a favorite vacation spot or simply go to a local park. The details of where and how long are not as important as your commitment to connecting with your spirit. Time to BE – A conference with your spirit is not simply a vacation – it is more than that. It is a time to slow down and BE. It is time to make the journey inside and connect with your core self – your essential spirit. Try not to plan too many activities on your trip so that you can appreciate the deliciousness of BEing instead of DOing. Make time to meditate frequently through the day. This doesn’t have to be in a formal sitting meditation. You might choose a mindful meditation practice while you walk. Enjoy your surroundings and the beauty that is around you. Stop and smell the roses – literally. Lighten up – It is important to enjoy yourself and have fun during your conference with your spirit. Laughter and playfulness are great ways to connect with your essential spirit. Find activities that help you feel child-like and playful. Ask for guidance – A big part of your spiritual retreat is to be quiet and still so that you can ask for guidance from your essential spirit. Your essential spirit is your storehouse of infinite wisdom. This is the time to evaluate where you are in your life and where you want to go. Look at each of the major life areas (physical, emotional, mental, spiritual, social, financial, work, etc) and ask yourself if your actions are in line and in accordance with your soul purpose. If you are not yet sure of your soul purpose, ask for clarification about this. It is time to look inside for your guidance and answers. After all, everything you need to succeed is inside of you. Listen – Asking for guidance from your essential spirit is the first step. Listening is the next step. When you allow yourself to BE present in the moment, you will be able to hear that quiet, still voice inside - that is your intuitive voice. Be aware that answers can come in many forms – thoughts, feelings, hunches, coincidences… be open to receiving. Pay attention to how you feel and what is happening around you. Your answer may be in the butterfly that lands on a flower near you or an image that flashed in your mind’s eye. Record your experience – Be sure to take a camera, a journal, and perhaps a digital recorder so that you can capture your experiences. Staying connected – After your conference with your spirit, the key is to maintain this connection you have forged with your essential spirit. It is important to take time each and every day to nurture this relationship. It doesn’t have to be complicated or take a lot of time. However, it is important to make this a part of your daily ritual and to set your intention to strengthen and deepen this connection. Take time to look at your photos and journal entries to you remember your conference with your spirit and your experiences. A regular practice to nurture your spirit combined with periodic conferences with your spirit will allow you to stay connected to your essential spirit. A strong connection with your essential spirit means achieving your highest potential for health, happiness, and success. In addition, this connection will help you develop an unshakable inner peace that allows you to stay centered even in the midst of chaos. This is the secret to developing authentic personal power and creating the life of your dreams. The holiday season can be stressful and chaotic for many people. Whether it is fighting through the sea of people in crowded stores, making appearances at the seemingly never-ending list of gatherings, or the financial strain on the wallet, many people feel overwhelmed and stressed out during the holidays. It is unfortunate that the season can be so stressful. The holidays are meant to be a time to celebrate family and friends - a time to come together and enjoy one another’s company. It is a time to give and receive the gift of love as well as to offer support to people in need. It is a time of spiritual renewal. If you happen to be like many people, the beauty of this season may be lost in all the hustle-bustle. You face lots of stressors everyday, especially during the holiday season. However, it is how you react to these stressors that is important – not the details of the stressful events. Using healthy coping skills can help you learn to ride through the stressful times with grace and a cool head. Managing your stress level will allow you to connect more fully with the spirit of the season and enjoy your holiday preparations and celebrations. The following 12 suggestions will help you cope with the holiday stress and put the jingle back in your mood. Stay Positive! You are in control of your attitude – choose to be positive. Use affirmations and the power of positive thinking to stay positive. For example, you could say to yourself "I am calm and stay connected to the beauty of the holiday spirit." When you are feeling overwhelmed with the pressures and commitments during the season, change your "stinking thinking" to something more positive. Focus on the things that you do enjoy. Remember that your attitude isn't dependent upon what happens to you, but on how you react to what happens. Use deep breathing! Practice deep breathing exercises to help you stay relaxed when you are feeling stressed. When you are stuck in traffic or waiting in the long lines, this is a perfect time to practice your deep breathing. Take a deep breath in as you count to 3, hold it for a second or two, and then exhale to count of 3. You might count to 4 or 5 - the important thing is to stay focused on your breathing and allow the experience to be relaxing. You could also imagine that you are breathing out your stress and frustration while breathing in calm and peace. Exercise! Exercise releases endorphins that lift your mood and your boost your overall well-being. Many people give up their regular exercise routines during the hectic holiday season. Exercise is most important when you are stressed, so even if you have to get up earlier or give up something else, make sure to get regular exercise. Park far away from the store so that you get a little extra exercise. Walk an extra lap in the mall to get those endorphins flowing. Try tai chi or yoga to help keep your body, mind and spirit fit. Practice mindfulness! Stay in the present moment by practicing mindfulness. While you walk through the stores, keep your attention on what it feels like to be walking (not on your list of things to do). Put one foot in front of the other and stay focused on each step. You could also try mindful eating by eating slowly and paying attention to the experience of eating. This will help you stay calm and peaceful no matter what is going on around you. Don't let yourself get caught up in the stress of your to-do lists. Stay in the moment. You can only do what you can do. If you stay calm and focused in the moment you will be more productive. Count your blessings! Developing an attitude of gratitude leads to better mood and a more positive outlook on life. Start a gratitude journal and each day record at least 3 things in your life for which you are grateful. Be earnest and sincere. Even if you are unhappy with your current situation, you can always find some things to be grateful for. Most of you reading this article can count as your blessings a place to live, food to eat, and a family to love. Even if you have health problems, you can look for areas of your health for which you are thankful - perhaps you have healthy teeth or strong nails. It doesn't matter how small a thing you identify, as long as you are sincere in your appreciation you can reap the rewards of an attitude of gratitude. Plan a head! Rushing around at the last minute trying to buy presents or shop for your holiday meal can be very stressful. Start a head of time and make plans. Make a list of the people for whom you want to buy gifts. Check your list to be sure you have included everyone! If money is tight, make a budget and stick to it. Plan a head for your party gifts - you might even want to buy a few extra general gifts (a bottle of wine or a candle) to have on hand. You can use these gifts if you get invited to a party at the last minute or to give to your neighbor (you know, the one you forgot to put on the list). Delegate! You do not need to do everything yourself. Let others help out in the planning and preparing for the holiday festivities. You can even have small children pitch in by helping to clean up, decorate the house and/or help with simple tasks in the kitchen. Make a deal with your partner – one of you wraps presents and the other cooks or cleans. Having everyone in the family chip in and help with the preparations can be fun and give you time to bond together. Practice random acts of kindness! Focus on helping those in need – good deeds can help you feel good about yourself (i.e. – donate to charities, let someone get in front of you in line, help a neighbor shovel snow, etc.). Research shows that doing a good deed also helps people who witness this good deed! You can really help make the world a better place by practicing random acts of kindness. Go out of your way to be sure you do one good deed a day. Compliment and encourage others. Put aside your hard feelings and reconnect with someone for whom you still hold a grudge. Share your positive attitude! A smile can be contagious - smile at the store clerks and the other shoppers in line. Smile while you are on the phone ordering those special gifts from your favorite catalogue - believe it or not the person on the other end can "hear" your smile. When you encounter grumpy holiday shoppers, resist being pulled into their negativity and try to spread your positive attitude. Make a game of it and see how many smiles you can get each day. Create new and meaningful traditions! If you need some help thinking of new traditions or ways to add meaning to your holidays check out my article – Making the Holidays fun and meaningful. When you have some special activities to look forward to it can make your parties and festivities more fun and special. Find ways to engage the entire family in activities or games. Let go of your need to be perfect! Your desire to make everything perfect can ruin your holiday. Let go and enjoy yourself. The world won't end if the decorations aren't perfect. Your family won't run you out of the house if the meal isn't just so. Perfectionism can lead to depression and anxiety. Relax and enjoy the spirit of the holiday and the company of family and friends. Learn the power of no! Sometimes the best thing you can do is to say no. People will learn to respect you for creating and maintaining your boundaries. Most people will understand if you need to say no to that party, project, or activity. You can't fit it all in and that's ok. If you are already overcommitted or you simply don’t want to attend an event, be polite and decline in advance. If you have trouble saying no, remember that the people who really care about you want you to take care of yourself and be happy. The key to managing stress during the holidays is to remember to use these coping skills (and any others that work for you) frequently. I suggest that you print this article and put it up on your refrigerator to serve as a reminder. The more you use your coping skills the better you will get at managing the holiday stressors. You are driving home from a stressful and frustrating day. The traffic has you socked in and you can feel your stress level going up with each minute that you wait for the traffic to begin moving again. Then your favorite song comes on the radio and you crank up the volume. Suddenly you forget your troubles and the traffic as you lose yourself in the beat of the song. You throw caution to the wind as you belt out the lyrics as if you didn’t have a care in the world. The song comes to an end and you find that your mood has lifted and you feel better all the way around. Most people have experienced something similar to this scenario and few would argue with the idea that music can enhance mood. Many people also identify with the way that quiet soft “new age” music can enhance relaxation and sleep. Is it wishful thinking or is there something to the idea that music can change our lives and improve our health? In the last few decades, music therapy has been receiving considerable attention among the scientific, medical, and psychological communities. Research has shown that listening to music can alter brain waves, respiration, heartbeat, pulse rate, blood pressure, and body temperature. In addition, music can boost the immune function, regulate stress hormones, decrease depression, strengthen memory, and reduce pain. In fact, research (published in the Journal of Advanced Nursing) has shown that listening to music for an hour every day can reduce chronic pain by up to 21% and depression by up to 25%. Results from this study held true for people who chose to listen to their favorite music and those who listened to “prescribed” relaxation music. In addition to helping reduce chronic pain, studies have shown that music helps expectant mothers and surgery patients decrease the amount of anesthesia and pain medicines needed. According to Don Campbell (author of The Mozart Effect), there seem to be several reasons that music can help reduce pain and decrease the need for pain relieving medicines. Perhaps the most significant of these reasons is that music can increase endorphin (the body’s natural “opiates”) levels. Endorphins are known to decrease pain and produce a “natural high.” Music also serves as a distraction from pain, helps relieve anxiety, and decreases the level of stress hormones. The bottom line is that music can and does influence your mood and your health. Next time you are feeling stressed, a little blue, or have pain, try a little music therapy. Pick some of your favorite music, put on your headphones, and close your eyes and let yourself get lost in the pure joy of the music. Give yourself permission to put aside your worries and your task list so that you can really enjoy this experience and reap the benefits of music therapy. I just took this picture from my balcony so that I could share it with you. It is a lovely morning. I could get used to blogging from this place. 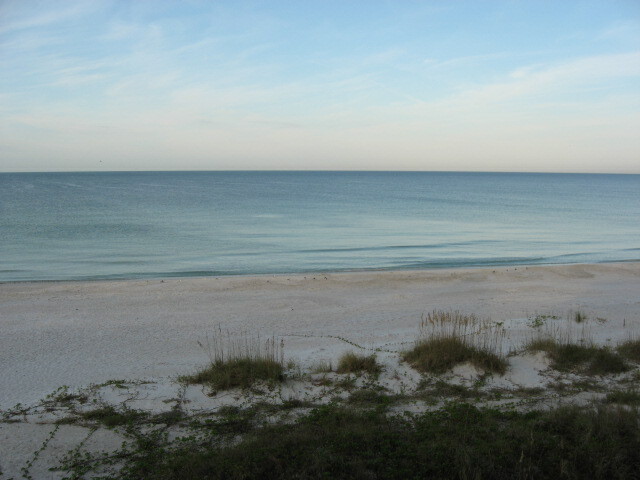 I love the sound of the very gentle waves rolling in from the Gulf of Mexico. It is one of the most relaxing sounds. It puts me into a trance-like state. The sand here is so soft and white and I love to run my toes through it. I come here every year and when I arrive it feels like I reconnect with a part of me that I left behind the year before. It is a homecoming. I get to spend Thanksgiving with my family on the beach and for that I am so grateful. I feel blessed beyond measure to be here in one of my favorite places on earth. I have seen dolphins swimming by everyday and that is a thrill no matter how many times I see them. I feel very connected with dolphins. As soon as I get here I go through an energetic exercise that I created to connect with the dolphins. Shortly after I do this exercise they show up in front of the condos. I haven't seen the dolphin that I named notch (because of injuries to his dorsal fin). I hope that he/she is still around. I love dolphins and it is a joy to see them and connect energetically with them. If the router issue get fixed, I will try to write some more this week. In case I can't get back here, I wish you all a blessed week and a happy Thanksgiving to those here in the US. I am on vacation this week. I am taking a road trip from Ohio to Dallas, Texas. I will be gone from June 30 - July 7. I am stopping in St. Louis and will get to visit with my blogging friend Kammie Kobyleski. It will be fun to finally meet her face to face. :) I'll post pics when I get a chance. On the way back from Dallas, I will be stopping in Memphis to see the Peabody Ducks. That should be fun! I will be checking in on the blog and responding to comments - though I may be a bit slower than normal to respond. Create a great week! If you have not yet heard about the group writing project I started, please check out Positive Thinking Day Group Writing Project post. As you come to the end of a work day or week, it is important to be able to clear your mind of the built up stress so that you can relax and enjoy your free time. Here is a quick imagery to help you do that. Imagine taking all the stress and tension from your day or week and putting it into a balloon. Make this image very vivid in your mind's eye. You can create this balloon any size and color that you choose. The important part is to imagine all of your stress energy and thoughts going into the balloon. When you have placed all of your stress into the balloon, imagine sending the balloon up and away. You can watch in your mind's eye as the balloon sails away carrying with it all of your stress and tension. Feel yourself relaxing and getting lighter as you release your stress and worries. This is a great way to clear your head and begin relaxing. Enjoy and have a great weekend! Here is a breathing exercise that is easy to do and will help you relax and feel refreshed. Close your eyes and take a deep breath in while slowly counting to four. Hold the breath for a count of two and then gently exhale to the count of four. Continue this cycle of breathing and counting for four cycles. Once you finish the four cycles, open your eyes and notice how you feel. If you still feel some tension or stress then repeat the process for another cycle of four. This breathing technique requires you to slow down and breathe deeply, both of which can help reduce tension. This technique also helps quiet the mind because you must focus on counting and breathing - this allows you to let go of distracting thoughts. As you practice this breathing technique, experiment with different numbers - try increasing the length of each breath and see how you feel. Here is a quick way to relax and refresh yourself - take a mini mental vacation. Close your eyes and take a nice deep breathe. Imagine yourself standing on your favorite beach. Create this image as vividly as possible. Pretend that you are really there. Pay attention to the colors around you - the blue sky, the brilliant turquoise water, and the white sand. As you breathe in you can smell and taste the salty mist. Enjoy the sound of the waves lapping on the shore... maybe even the sound of some seagulls flying by. It is as if you are there right now. Each time you imagine this special place you can feel yourself relax more deeply and quickly. You only need a minute or two to experience the relaxation and to clear your mind. This makes a great way to take a break during your hectic day. Have fun with this and enjoy your travels in your minds eye!